Cold War Asia (1948) covers three interconnected civil wars between pro-democracy and pro-communist forces following the end of WWII, circa 1947 to 1948 and extending past the 1950 Chinese Revolution, the Korean War, and the First Indochina War. Victory Condition... An alliance occupies 10 of the 11 Victory Cities. 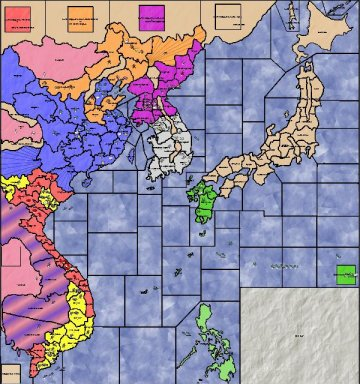 A second alternate history variant adds a hypothetical where the US did not drop nuclear weapons on Japan in 1945 and Japan was occupied by the US and USSR following WWII. This variant covers four interconnected civil wars, the three mentioned above plus an alternative history Japan civil war. Victory Condition... An alliance occupies 15 of the 16 Victory Cities.